Nasi Lemak is often mentioned to anyone traveling to Changi Village Hawkers Centre. Be it for breakfast, lunch or dinner, Nasi Lemak is a popular dish especially to the Malay community in Singapore. Nasi Lemak is a steamed-rice dish found commonly in Malay cuisine as breakfast. The dish has jasmine rice cooked with coconut milk to complement the fragrance. Traditionally served on top of pandan leaf with combination of cooked food, mainly deep-fried yellowstripe scad, chicken wings, eggs, anchovy with peanuts, and the sambal chilli. 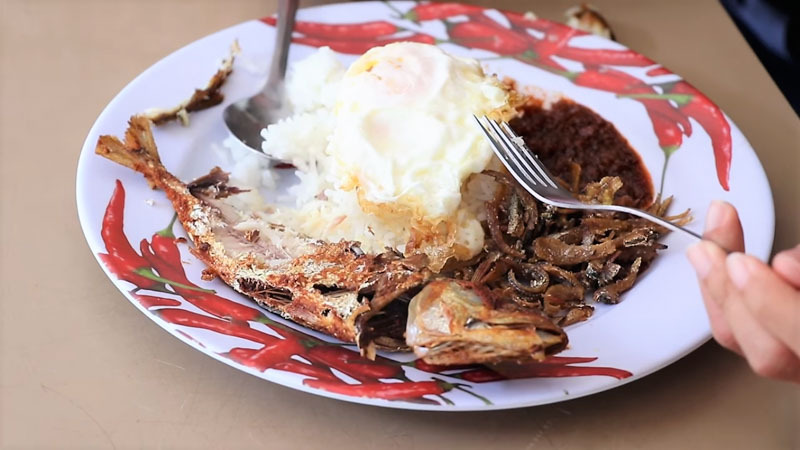 Because this is a Malay cuisine, some of the cooked food are named with vernacular terms, such as deep-fried yellowstripe as Ikan Kuning or Kuning fish and anchovy as Ikan Billis. Here in Changi Village Hawkers Centre, there are at least two stalls selling this Malay-style cuisine for over 20 years. A list of the stalls and review can be found in Best Nasi Lemak in Singapore. Particularly for Mizzy’s Corner Nasi Lemak stall has been championing the overall food ratings and business in Changi Village Hawkers Centre. This review compares with International Nasi Lemak: Alamak, which Nasi Lemak! Here showing their unique proposition of serving the dish Ikan Kembung (Indian Mackerel) over the traditional Ikan Kuning (Yellowstripe Scad). In my opinion with the alternative choice, the size of mackerel fish is certainly meatier than Kuning fish.